In light of yesterdays sobering (and true) declaration of DREAD that can come with the holidays, I want to throw some levity and an actual Strategy into the mix. It really doesn’t have to be heavy or feel like “work” we have to get done before we dive head in to survive the chaos. Want to know how movies and pop culture can change your experience from surviving to THRIVING? Remember that GroundHog Day with Bill Murray? His character essentially wakes up to live out the same day over and over again – doing the same thing and getting nowhere. Nothing changes. He finally surrenders to the fact that nothing is going to change, so he starts to get more creative with the time he’s given. He learns to play the piano and carve ice sculptures. He explores this ‘purgatory’ and learns so much about what he is capable of when he changes the way he approaches the day. The same goes with our life. There can be this level of “same-ness” (aka traditional) or things become ridiculously predictable. It could be with the holidays coming, your job situation, romantic relationship or an overall routine rut in your life. What surprises me is that at Christmas in particular, we don’t see each other a lot during the year and yet collectively we create a rut by playing out the same roles and holiday routine every year – as a group! It’s hilarious in a way. So, maybe you always go to your parents on Christmas Eve every year and Uncle Jo always hurts your feelings by saying something shocking. Your cousin sits in the corner and sulks. Your brother-in-law likes to get confrontational with you about hunting and you are an animal activist. Or maybe your Mom plays passive aggressive mind games about you eating gluten free and how that’s really inconvenient. Blerg! 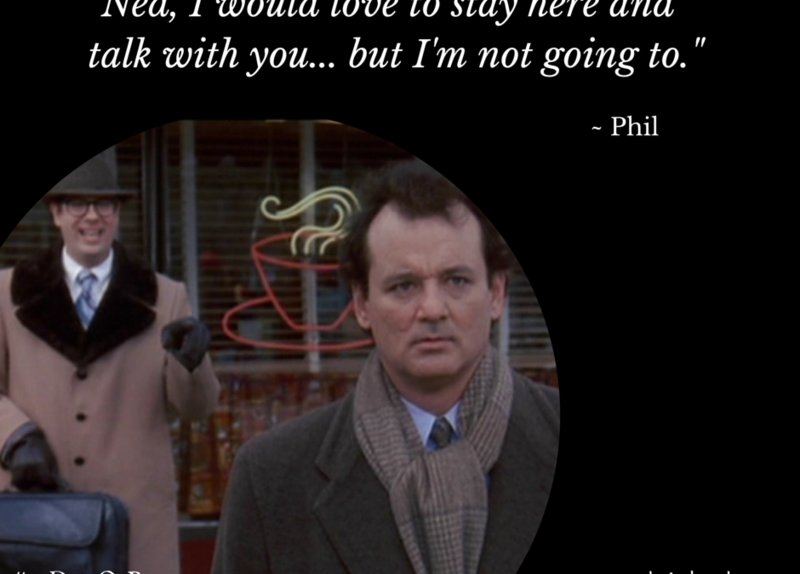 Whatever predictable and unpleasant routine you dread is coming, I DARE YOU to “GroundHog Day” it! Go in there and completely mix up the norm. If you were to do anything differently, what would that be? How could you act? What could you say? How could you really change things up? Just IMAGINE all the options here! Go wild and bring in the ridiculous. Instead of preparing yourself to just get through it (without punching someone in the throat or stuffing your emotions) and feeling bad about yourself — Humour me. What if you spent your time consciously creating a different approach that makes it fun, more meaningful or enjoyable for YOU ? Tomorrow, I will share a funny story (video post) about how I turned a typically heavy, burdensome experience into one of the funniest exchanges I’ve ever had with a person. It was a riot and in this moment, reminds me to bring more of this person to the table more often. Talk about a game-changer. My hope is that these stories and strategies give you some wiggle room with how you approach the difficult or awkward this season (or anywhere in your life for that matter). We can’t change the way others behave but we can change our relationship to those people and the way we approach the situation. 1. What is the situation you want to change or avoid? Your sibling loves to ‘one-up’ you at every opportunity. 2. How do you typically respond (feel / behave)? I feel annoyed, triggered, angry, reactive, defensive and usually shut down / lash out. 3. How would you love to respond (feel / behave)? I’d love to feel like it doesn’t bother me, like it’s laughable or that it doesn’t even phase me. Derek is empty headed and believes he is ridiculously good-looking so I could see him pulling out his best “blue steel” look and dance-fighting his way through it. To the death. But really – if it’s always the same and you are sick of it, at least THREATENING your sibling to a dance-off with winner taking all, would certainly change the game, don’t you think? And maybe even get a laugh to shift the energy. What have you got to lose? You’d completely take them off-guard. You don’t have to take it so seriously wishing they would change. It becomes more fun. More importantly… YOU become more fun. Bottom line in all of this, ask – How can I make these situations better for me? And try to make small changes to experience this. So tell me – Have you done this before and if so, what happened? Share your thoughts, comments or stories below for us all to learn and play from.